A highly effective method of obtaining feedback regarding case issues from a large number of individuals is the Survey Research Project. This Project typically provides a written case synopsis, along with exhibits and questionnaires to a large number of recruited participants, usually ranging from 50 to 250 individuals. The surrogate jurors are recruited in the same fashion as participants for focus groups and mock trials, and in terms of percentages, they represent typical jury panels. They come to one location at a set time, read about a case, and then complete questionnaires before leaving. 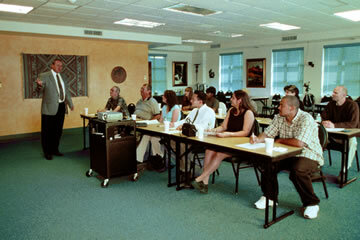 A partial "live" presentation can also be worked into this Survey Project. As with focus groups and mock trials, results are tabulated via a sophisticated scanning and statistical program, and full reports are provided on participant reactions to case arguments, exhibits, jury instructions, witnesses, or other pertinent issues. In addition, a cross tabulation between "juror" responses, demographics and "verdicts" are compiled to assist with developing juror profiles, voir dire questions, and supplemental jury questionnaires. 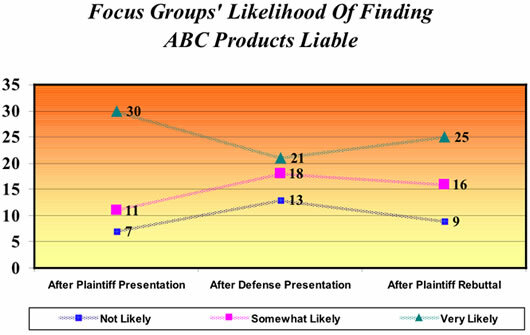 The graph to the right reflects 50 participant reactions to a products liability case. Reactions were obtained after the group had reviewed materials regarding Plaintiff arguments, again after reading material on Defense arguments, and then following paperwork on the Plaintiff's rebuttal. Jurors then completed the questionnaire on specific case issues.